Tyson Fury has been in some big fights over the years, none more so than his fight with mental health issues including depression and suicidal thoughts. His mental health battles have made him determined to help other people who suffer from mental health issues and also to help the homeless. He has told the Irish Mirror that he will be donating his purse from Saturday’s bout against Deontay Wilder, a reported £8 million. 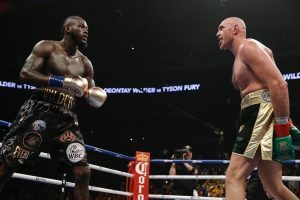 Fury may not have got the result he wanted in Saturday after his fight was scored a draw with Wilder however it seems he has a bigger picture of what he wants to do with his life and money. He continued, “When I go home I’m going to build some homes for the homeless and set up some funds for drug addicts and alcoholics. “I was always going to do it but being here (in California) gives me that extra push to go and do it even more. “It has really opened my eyes to a lot of things and I’m leaving as a better person. “There are a lot of homeless people on the streets here, more than I’ve ever seen ever in my life. I’m staying in downtown LA but if you go five minutes down the road there’s like – I don’t know- thousands of homeless people. Fury also wants his kids to have to earn their money the same way he had to graft for his. “I believe all kids should make their own money in life because if they don’t, they won’t appreciate it,” Fury said.